There are two first appearances in this key issue, one really important, and one not quite as important. Unfortunately, I'm going to start off with the not quite as important appearance first, and that would be the Weather Wizard. In the first of the two stories in this comic, we have ordinary everyday criminal Mark Mardon on his way to prison. He manages to escape and makes his way to his brothers, where he finds him dead from "a heart attack or something". Mardon stumbles upon his brothers notebook on his weather controlling experiments, and uses the information to create the Weather Wand. He uses the wand to create distractions while he commits his crimes, and also to get revenge on the police officers that had arrested him in the past. 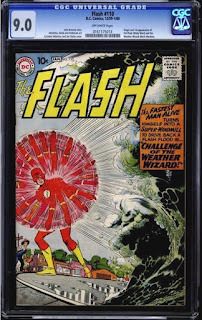 The Weather Wizard would eventually become one of the members of Flash's Rogues Gallery. That's all for The Master of the Atmosphere, now let's get to the real reason for this post. That would be the first appearance of Wally West as Kid Flash. Wally is the nephew of Barry Allen's girlfriend at the time, Iris West. She brings Wally to see Barry hoping that he will be able to introduce Wally, the president of the Flash fan club, to the Scarlet Speedster. 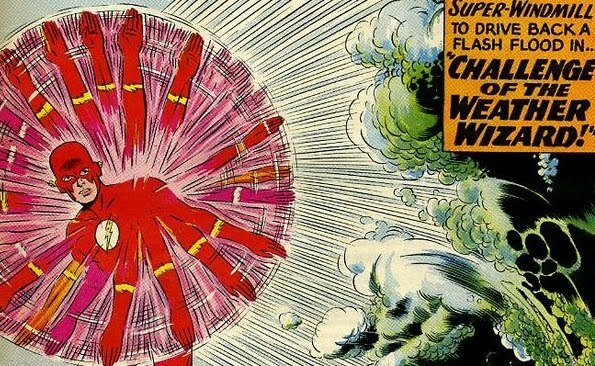 There must have been a lack of creativity at DC at the time because, as The Flash explains to Wally how he got his powers, the same exact thing happens to him. A bolt of lightening blasts through the window, spilling chemicals all over the poor boy and giving him the same super speed that The Flash has. See, I told you.. not very creative at all. This is considered a super key issue. Wally West is a very important character in the DC universe. He would eventually remove the kid from his name, and take up the mantle of The Flash after Barry Allen sacrifices himself in the Crisis on Infinite Earths story arc. It seems like a lot of comics from this time are for more scarce that comics that were printed even a few years later. That could be because of lower print runs (not likely) or because they were read, passed around and read again, and eventually thrown in the garbage (more likely). Either way, the CGC census for this book is quite low. As of this writing, only 292 copies are listed on the census. Most are low to mid grade but there are a handful of higher grade copies. The highest grade listed so far is a 9.2 NM-. There are four total copies at that grade, one of them being a Restored copy. Because this is such a big key issue, the prices for already graded copies are quite high. According to GoCollect, values for have seen a nice rise over the last four years, mostly for mid grades. It looks like there was a spike in demand in 2014, I'm assuming that was because of the Flash T.V. show. Values have come down slightly since then, but this comic is still going strong. 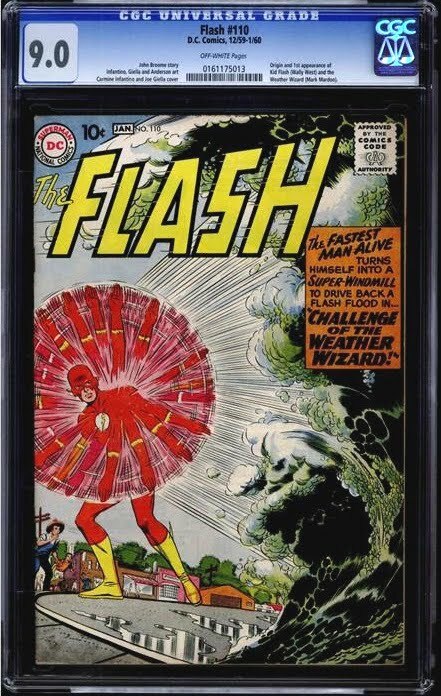 The latest sale on eBay (7/12/2016) dropped for $790 for a CGC 5.5 F- and a CGC 8.0 VF also recently sold in March of this year for $1,500. In my opinion, whoever snagged that got one hell of a deal. For example, a CGC 7.0 F/VF, which is one full grade lower, sold at Heritage Auctions in August of last year for more than that. It ended up selling for $1,673. Will the appearance of Kid Flash appearing on the popular CW show cause another spike in values? It's very possible, but you'll have to pull out your checkbook if you're looking for a decent looking copy. As you can see from the chart above, even very low grade copies are selling over the $100 mark. As always I wish you luck on your hunt. Wish I had got this one before season one of the Flash TV series! I know what you mean. This comic wasn't really even on my radar back then.